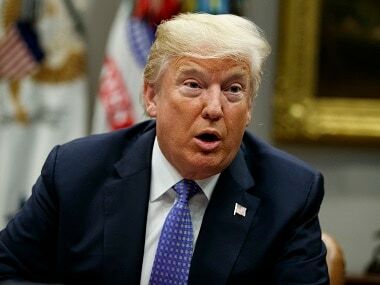 Washington: US President Donald Trump said he and North Korea’s Kim Jong Un have fallen “in love” — their bromance fuelled by “beautiful letters” he received from the leader of the nuclear-armed state. Trump on Saturday elevated his recent praise of Kim to new heights, at a West Virginia rally in support of local candidates for his Republican Party. “And then we fell in love — OK? No really. He wrote me beautiful letters and they’re great letters. We fell in love,” Trump told the crowd. Trump used his debut address at the UN General Assembly 12 months ago to threaten to “totally destroy” North Korea and belittle its leader as “rocket man,” prompting Kim to respond by calling the president a “mentally deranged US dotard.” Those were among a series of playground-type slurs the leaders of the two nuclear-armed states hurled at each other, setting the world on edge. Last August, after US media reported Pyongyang had successfully miniaturized a nuclear warhead to fit into a missile, Trump warned Pyongyang not to threaten the United States or it would face “fire and fury-like the world has never seen.” Kim had earlier compared comments by Trump to the bark of a “rabid dog,” and Trump derided Kim as a “sick puppy” — before the apparent outbreak of puppy love. North Korea’s foreign minister Ri Yong Ho on Saturday told the UN there was “no way” that his country would disarm first as long as the US to push for tough enforcement of sanctions against Pyongyang.